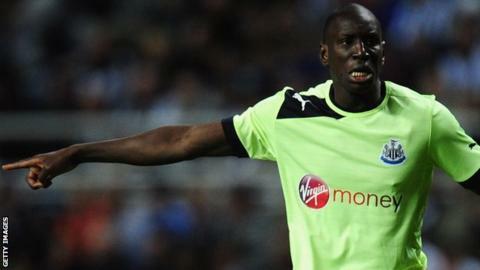 Former Newcastle United striker Patrick Kluivert has told Senegal forward Demba Ba to stay at the club. The 27-year-old is believed to be frustrated with his role at the club and talks over a new deal have stalled. Newcastle manager Alan Pardew has admitted the club's top scorer last season could leave for £7m in January. Ex-Netherlands international Kluivert, 36, told BBC Sport: "Stick with your club and, if you do well for another year, you can look to another club." Ba expressed his displeasure at being a substitute in Monday's 2-2 draw at Everton, a game in which he came off the bench to score both of Newcastle's goals, and the club were exasperated by comments from his agent Alex Gontran suggesting Ba might seek a move if he continued to play second fiddle to Senegal team-mate Papiss Cisse. "[Ba] did a great job and scored a lot of great goals last year," added Kluivert. "It is very easy to say after he had a good year with Newcastle that he wants to leave. "He's a great striker and I bet a lot of clubs want him and that's probably why [his agent] said that." Pardew said the club was "vulnerable" after revealing that a £7m buy-out clause is still active in the new year. Kluivert, assistant coach for FC Twente and the Netherlands, said: "I think [Pardew] knows another big club are after his player so for a manager at Newcastle, it's not an easy job. "He has to convince the player that he is a very important for the team and not to say directly that he wants to leave. "It's not a good thing for a manager to say that in public."